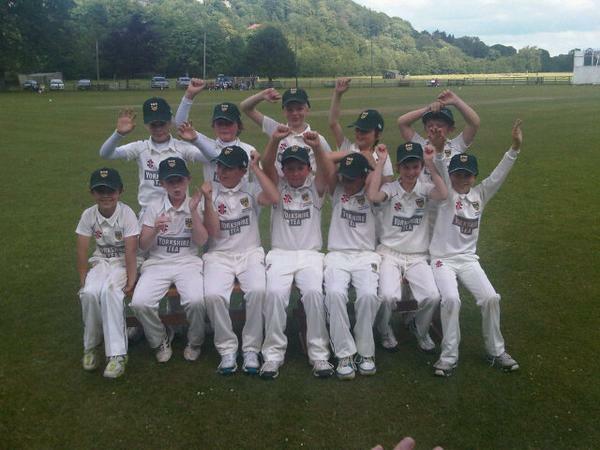 Oli Ward helped the Nidderdale U10s to victory over Bradford today with bat and ball. The match report reads. An exceptional game of cricket. Nidderdale requiring 2 to win off the final ball which was edged to third man for 4. Bradford started well with Lachlan Doidge compiling an excellent 50. Nidd then fought back in the second half of the innings with Caleb Bradford taking the first 4 wickets .Sharp fielding and good support bowling by Ollie Ward and Alfie Bartle allowed Nidd to bowl Bradford out in the 29th over. Nidd based their innings around a superb 60 from Ollie Ward who showed great maturity, putting the bad ball away and taking some risk free singles. Jo Guthrie added impetus to the innings with a cavalier knock. Bradford then fought back with 12 required off the last 2 overs. Both teams can be proud of their performance and attitude throughout the game. This entry was posted in Uncategorized on June 28, 2015 by knaresboroughcc.